Peace Corps Online: September 1, 2003: Headlines: COS - Belize: Agriculture: Plenty: Five of GATE’s Garden Specialists attended the training, along with several Peace Corps volunteers (PCVs) from around the district, one PCV from Cayo District, and the Peace Corps assistant Belize country director stopped in as well. 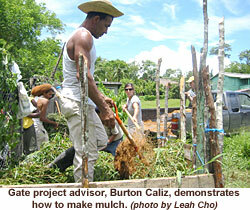 September 1, 2003: Headlines: COS - Belize: Agriculture: Plenty: Five of GATE’s Garden Specialists attended the training, along with several Peace Corps volunteers (PCVs) from around the district, one PCV from Cayo District, and the Peace Corps assistant Belize country director stopped in as well. Peace Corps Online: Directory: Belize: Peace Corps Belize : The Peace Corps in Belize: September 1, 2003: Headlines: COS - Belize: Agriculture: Plenty: Five of GATE’s Garden Specialists attended the training, along with several Peace Corps volunteers (PCVs) from around the district, one PCV from Cayo District, and the Peace Corps assistant Belize country director stopped in as well. Five of GATE’s Garden Specialists attended the training, along with several Peace Corps volunteers (PCVs) from around the district, one PCV from Cayo District, and the Peace Corps assistant Belize country director stopped in as well. Now that summer break is over, the GATE school gardens project is beginning again at 7 primary schools in the Toledo District. A training session for village garden volunteers was held on August 27th at the garden in Laguna village. Five of GATE’s Garden Specialists attended the training, along with several Peace Corps volunteers (PCVs) from around the district, one PCV from Cayo District, and the Peace Corps assistant Belize country director stopped in as well. Three Sustainable Harvest extensionists were also on hand, as were two young people from last year’s Laguna village school graduating class. We talked about, and then proceeded to do, some of the basic hands-on things required to get a school garden started — preparing a raised bed in case of rainy weather, mulching, building a raised seed box and making a compost bin. There are now PCVs in four of the GATE school villages: San Jose (our old friends Harry and Margy Bennet), Laguna, Barranco, and Golden Stream. This could be quite a help in providing technical assistance, depending on their level of interest and organic gardening knowledge. We now have village volunteers in Barranco, Mafredi, Laguna, and Golden Stream villages, and we are seeking volunteers in San Jose, San Pedro Columbia, and Punta Gorda Town. The new Peace Corps volunteer in the village of Big Falls has motivated the Big Falls school to start a school garden, and came by asking what assistance they might be able to get from Plenty. She is planning on getting funding for fencing and hopefully some start-up tools. I have created a questionnaire for the garden school staff about their needs and long-term sustainability prospects. I am starting with the questionnaire as soon as school starts in the first week of September. I will base plans for the year in large part on the answers I get on these questionnaires. The number one development need throughout Toledo is economic opportunity. Recently, 41 people in the village of San Jose attended the first day of micro-enterprise training organized by the Belize Enterprise for Sustainable Development (BEST). Mack Petors of BEST taught most of the sessions on subjects such as entrepreneurship, introduction to business planning and marketing. I taught a session on conflict management. Conflict management is essential for working in groups, and is something that I did as part of teaching high school years ago. It has also been one of the “appropriate technologies” that Plenty has always emphasized. Candido Chun of Sustainable Harvest International provided translation as needed. Candido and I have been going to monthly “Mentoring” meetings held by BEST. Their goal is to foster micro-enterprise in Belize, and they are using “mentors” to help identify who or what groups could benefit from the trainings they offer. We had suggested several groups in San Jose village that had come to us for support, and BEST opened up the training to include anyone who wanted to attend. Several farmers groups, several crafts groups, a woodworking (furniture) group, and corn mill group came for the San Jose training. We have a follow-up meeting scheduled in San Jose on Sept 5th, and another training session planned for October. The Food and Nutrition and Agriculture Fair that was being planned for October 15th here in Punta Gorda has been changed to incorporate World Food Day on October 16th. Plenty Belize has been very active on the committee organizing this fair. I am the chairperson of the educational subcommittee, and also am on the publicity subcommittee. The planning group successfully lobbied to have our PG fair become the National World Food Day celebration for Belize. This brings in some additional funding from the government and the UN’s Food and Agriculture Organization (FAO), and increases the publicity. The five secondary schools and the eleven primary schools participating in the School Feeding Program will be invited to compete in poster contests. A prize will be awarded by the Ministry of Agriculture for the Best School Garden and Best Youth Farmer. Prizes will be given for the most innovative youth display relating to food, nutrition, and agriculture. The theme of this year’s World Food Day is “International Alliance against Hunger.” Plenty Belize will run a booth with samples of soy foods, vegetables and nutrition information. Plenty volunteer Tomas Heikkala has ordered all the necessary equipment and supplies for the solar lighting system at the San Jose Village Community Center/Hurricane Shelter. These will be shipped to Belize in September and we’ll report on this project’s progress in our next bulletin. Plenty Belize staff has been meeting with the Toledo Development Corporation and the Toledo Center for Employment Training to organize our end of the project we’re doing with the US organization, Bikes Not Bombs (BNB) to bring a “container” load of bikes (approximately 450 bikes and bike parts) to Toledo. When BNB ships bikes to a place like Toledo, they send a trainer to teach a group how to build, maintain and repair bikes and set up and manage a sustainable microenterprise based on the sale and repair of bikes. i also wish to continou my agriculture carare in ur country.i will be very grateful if this favour is granted to me by ur fellow country men. i am obase emmanuel a cameroonian am interested in ur country belize.i am a student i wish to migrate to belize i do not know what to do pls i need ur help. Hi my name is Bernard I need some help. Where do I buy quiroa seed.I live in Paraiso Village Belize.